We have helped thousands of clients to have their UK and Irish documents legalised for Saudi Arabia. We're so confident you can trust our service that we will refund your entire order if your documents are rejected. In fact we've never had a document rejected in Saudi Arabia so this is a fairly safe bet for us. To order your legalisation service, please choose whether your document has already been stamped by the Foreign & Commonwealth Office (or by the Department of Foreign Affairs in Dublin) or not. 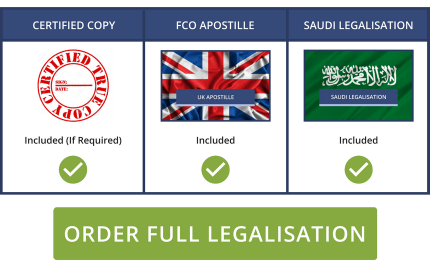 Using our Saudi Legalisation services will give you complete peace of mind and will ensure that you get what you need in a timescale to suit your needs. Being fully aware of what the Saudi Embassy in London need to make sure that your attestation service is handled quickly and efficiently means you can sit back and relax knowing that everything will be dealt with quickly and efficiently. If you have questions we have a specialist team ready to take your call NOW on 0330 088 1142. Alternatively you can fill in our enquiry form or contact us. NOTE 1: All documents being legalised for Saudi Arabia now require a copy of your passport along with the rest of your documents. Please make sure to include this when sending your documents to us. NOTE 2: The Saudi Arabian Embassy no longer accept Disclosure Scotland and DBS Police Certificates for legalisation. 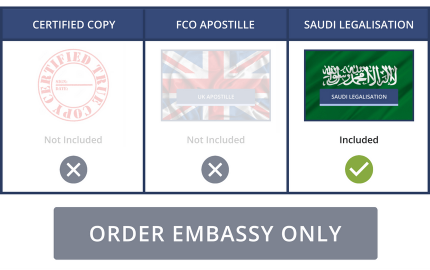 If you need a Police Certificate legalised for Saudi, please acquire one from ACRO instead. NOTE 3: Please be aware that ACCA Certificates require the work to be done on the original document, so a certified copy can not be made.